With foodservice customers eating more healthfully, fish has gained importance on menus in a growing number of non-commercial operations. But that has brought with it questions about sustainability. Operators are beginning to examine more carefully how and from where they purchase fish, not only to ensure they are getting good product but also to guarantee that they are not contributing to the demise of any species. The fish that appears on the menu varies with the season and can be either wild caught or farm raised. Among the locally wild-caught fish are red snapper, grouper, amberjack and pompano. Farmed fish can include keta, catfish and swai. The local fishmonger also specializes in white sturgeon, a fish harvested about 45 miles away. On the eastern shore of the state, sustainability is also important for the senior living facilities that are part of ACTS Life Retirement Communities. Even in the interior of the United States, fish is gaining acceptance, particularly on college campuses. At Illinois State University in Normal, for example, fish can be found on the menu every day, according to Tim Gump, executive chef at the 20,000-student institution. Varieties run the gamut: salmon, cod, catfish, tuna, tilapia, sole, mahi-mahi and rainbow trout are among the species served, based on seasonality and availability, with salmon being by far the most popular. Gump emphasizes that all fish served are solid muscle fillets; no chopped, formed or minced fish is ever on the menu. 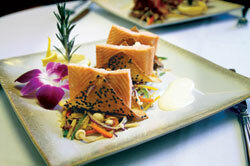 Out west, at Utah State University in Logan, fish is served “very often,” according to executive chef Don Donaldson. Farm-raised fish is found more often than wild caught at this 23,000-student college, with salmon and tilapia the most common fish, followed by Cape Capensis cod and trout. But Donaldson admits that he and the foodservice staff are still learning about seafood sustainability, and price still drives Utah State’s purchasing decisions. “We feature salmon every Friday at the Junction,” says Donaldson, referring to the main residential dining facility. “We serve about 50 pounds each Friday. So far farmed salmon is the only viable price-per-pound option. I have been trying to get more information from [vendor] US Foods on how the salmon is farmed. They have recently partnered with a company in Washington state to improve their fish program. I am waiting to hear more about that. As concerns about overfishing have risen in the past few years, several organizations have stepped forward to help monitor the fishing of many species of seafood. Groups such as the Marine Stewardship Council and the Monterey Bay Seafood Watch monitor fisheries to try to protect some species from being overfished and to try to steer consumers toward those types of seafood that are more sustainable choices. For example, Pacific cod ranks high on the sustainability chart, but it also tends to be higher in mercury and low on the omega-3 scale. So while it is not an overfished species, it isn’t necessarily a good choice for, say, a hospital foodservice program to offer. To see how this interactive guide works, visit natgeoseafood.com.